Size: L 12" B 3.5" H 8"
Matching up with the requirements of our clients, we are involved in offering Stylish Silk Bag. We are the best manufacturer, exporter and supplier of the Silk Handbag with Leather Trims to our client as per their requirement. Description : In pure silk with Genuine Leather Trims . This Handbag has detachable Shoulder strap. Dimension 13 " L x 15" W , Height with Handle - 24"
With Poly Wong D Silk Fabric specially designed for Hight Quality digital printing, We are engaged in manufacturing and supplying an excellent range of Poly Wong D Silk Handbag. 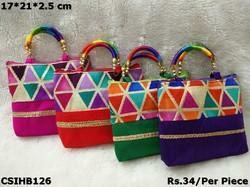 Reshmi Three Patch Bag. Ahir Work, made up of Satin Silk . Bright colors combination with embroidery patches used in single zip bag.Smart and useful to carry regular college bag. From pure silk material, fashion bag, hand embroidered and fine finish. 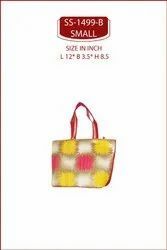 We are one of leading service provider for silk bag. We believe in serving our customer with high quality products.